Stumbled across this image of the three unusual suspects of The Most Secret Place on Earth on this Bangkok Expat blog. Taken at the packed FCCT (Foreign Correspondents Club Thailand) in November 2010 during our presentation and Q& A session of aforementioned documentary on the CIA’s covert war in Laos in the 1960s. 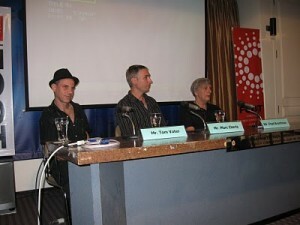 From left to right: Writer Tom Vater, director Marc Eberle and one of the film’s main protagonists Fred Branfman.